Right now, my mother-in-law is in Brookdale Bellevue. The food is actually pretty good. I have nothing to compare it with, but I know the price is five stars. I wouldn’t want to live there myself. I think the location is bad, and they’re pretty much like prisoners in the place since there’s not enough room to walk. So, I’d give it a five-star price with a three-star location. She’s not happy; she can’t get over to see her friends as much as she would like to. Brookdale Bellevue provides residents with spacious apartments in an upscale and active community. Residents enjoy plenty of opportunities to socialize. This community sits on beautifully manicured grounds with an abundance of outdoor seating in a pleasant, residential neighborhood. I love how inviting the lobby is with its large reception area. The décor throughout common areas is upscale and designed for comfort. The activity room is large with no-frills furnishings. During my visit, the mood of residents appeared very upbeat. Everyone was active and doing something. Many residents were talking, watching television, playing cards or just chatting. The staff was friendly and engaged as well. The dining room has a hotel-like quality, and a large menu. Residents have multiple options for starters, soups, salads and sides, plus at least three daily entrees and two daily desserts. Low-fat, low-sodium and low-sugar items are clearly marked. One of the highlights of this community is the robust and varied activity calendar. A wide range of activities are scheduled daily. In addition to concerts and lectures, there are several outings weekly to museums and cultural spots, not just shopping and errands. Amenities at Brookdale Bellevue vary between the assisted and independent living communities, and extra fees can be costly. They allow Pets this is a plus as my resident is alone and to have her pet is a great benefit. During her recovery for her knee she was able to have her physical therapy visits on-site making it so much easier for her. They have several programs in place to help with the cost including the shared suites program I was hesitant at first to have her living with someone else but it has worked out for the best and the two of them are great buddies and she is provided companionship. They worked with us diligently to come up with the best possible plan for her. From day one they have communicated with us regarding her health, happiness and are always eager to make any changes or do what is needed. Brookdale Bellevue is a great community within itself and I am very pleased to have my loved one staying there. Wonderuful, warm and welcoming, very pretty Assisted Living community, with lovely grounds. Provides higher levels of care as needed and also a lovely secured memory care area. Friendly, committed, caring staff and happy, friendly, engaged residents. The best way to get to know a community is by scheduling a tour. 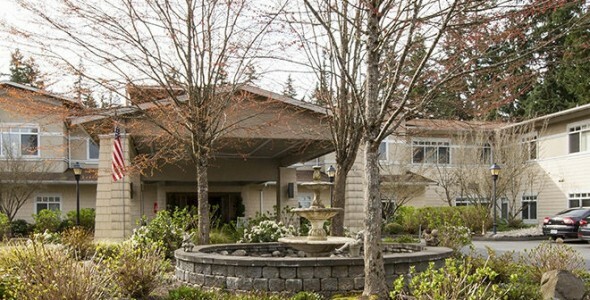 See the facilities, meet the staff and residents, and get a feel first hand what it's like to live at Redmond Senior Living Assisted Living. We are a two story building with 114 apartments. 87 in Assisted living with a mix of studio, one bedroom and two bedrooms. The community is situated on manicured grounds off the street with three courtyards to enjoy the landscaping and different seasons. Our Memory Care is secured access with large courtyard fenced for the resident's enjoyment and safety. We are located in Central Bellevue, close shopping, Overlake Hospital and freeways.